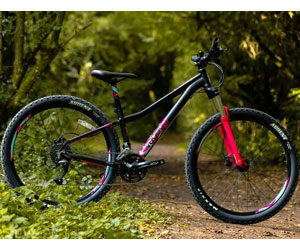 Does The VooDoo Soukri Womens Mountain Bike Appeal To Female Riders As Much As It Should? The VooDoo Soukri Womens Mountain Bike is a great concept for a women that long after some high-end, attractive mountain bikes, only to find that they are men’s models, and therefore not suitable for their size or frame. The main aim with this bike is pretty simple, to provide a women’s version of the popular men’s model, where women can ride just as hard and fast as their male counterparts in perfect comfort. It sounds like a great idea to have a female-focused bike to meets these needs, but does this model actually live up to buyers expectations?